At CHD Expert, we understand that the supply chain is an incredibly complex system, and we know how crucial it is for suppliers to have detailed, comprehensive information about the restaurant industry in order to be as profitable as possible. This is why each year we compile and segment robust data on the volume of restaurants operating across the United States. 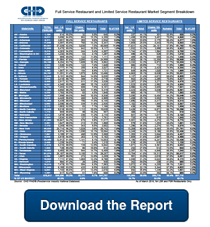 In our 2016 Restaurant Unit Report, we have detailed the Full Service Restaurants (FSR) and Limited Service Restaurant (LSR) landscapes in each of the 50 United States as well as broken down the data by menu type and segment. The Unit Report also further segments chain and independent operators. As of March 2016, CHD Expert reports that there are over 678,000 restaurants in operation across the United States, showing positive growth from 2015. Of the 50 states, Iowa has the largest percentage of total LSR chain restaurants, with 75 percent of the state’s restaurant landscape. With regard to independents, New York has the largest percentage of independents, with 60 percent of the state’s LSRs being independent. To access the 2016 Restaurant Unit Report in its entirety, please click here.